I must admit that when I finished this book, I found that I had actually enjoyed it! There are many problems here though, not to say the least. There are plenty of references to past Doctor Who adventures that we have on television, some of which take up too much space in the novel. But the references don't just stop with Doctor Who, I also noticed some cheeky little nods to Star Trek thrown in too! But the one thing that saves this novel is it's unique plot. 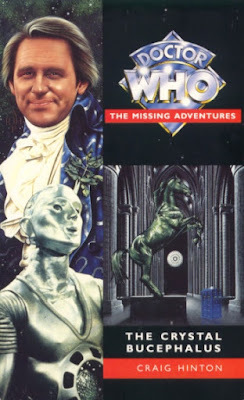 The Fifth Doctor, Tegan, Turlough and Kamelion end up being dragged into a murder investigation at the time travelling restaurant, The Crystal Bucephalus. This investigation quickly leads to a conspiracy to take the restaurant over. While the plot structure is very traditional in style, it does lead itself quite well to the more wordy format that author, Craig Hinton tends to use as many of his novels often feature quite outlandish plot devices and storylines. I believe this was his first Who novel when it was published in 1994 and I felt the dialogue to be a little amateurish and there is little in stand out lines except for the line on the back cover. The prologue is quite witty and it picks up in the final few chapters where what has been written changes to something a little more readable. Reading this novel, it is clear that Hinton was a fan of Doctor Who as he effortlessly manages to make the Fifth Doctor come across much in the way he did on the television. I must give double points to Hinton for making this Doctor recognisable when he changes his costume from the cricketing gear to the French outfit he wears throughout the novel. Hinton also gives the Doctor's companions plenty to do. Tegan in particular gets to uncover much of the plot while travelling around with Diva/Hellenica/Monroe who is an upper class person from the future who seems to have a great chemistry throughout the book. It was nice to see Tegan travel back to 1980s London and hide out in McDonalds where she meets Dorothy, a woman who comes across very much like the Doctor's future companion, Dorothy 'Ace' McShane. Unfortunately, Turlough comes across just as bland as he did on the television but somehow manages to come across worse as he spends the majority of this novel trapesing around after the master of ceremonies at the Bucephalus. Kamelion, a lot like Turlough, doesn't come across well, his presence seems like a way to explain why we never saw him between his debut story, The Kings Demons and his final adventure, Planet of Fire. The supporting characters are some of the best from the novel range I have read. All of them are French with the fat Maitre 'D who fusses around the Bucephalus with little regard to others. You have your standard power-mad woman in Ladygay Matisse who you can't help but like, Professor Lassiter works with the Doctor for most of the novel and is a great comedy character used to relieve the tension. He gets some good scenes with the Doctor when they believe the TARDIS and his companions to all be dead. However, while the conspiracy sounds good on page, once you start to think about it, it all unfortunately falls apart. And I noticed there were a few continuity references which then cause continuity errors with the novel, Goth Opera which also features the Fifth Doctor joined by Tegan and Nyssa.